Earlier this month, Omidyar Network released a report called Big Ideas, Little Learners highlighting the mega trends and impactful innovations that we see changing the way our youngest members of society grow, develop, and learn. We are excited that the SXSW EDU community has identified similar trends and signals that will be discussed during sessions at their upcoming conference March 4-7, 2019 in Austin, Texas. 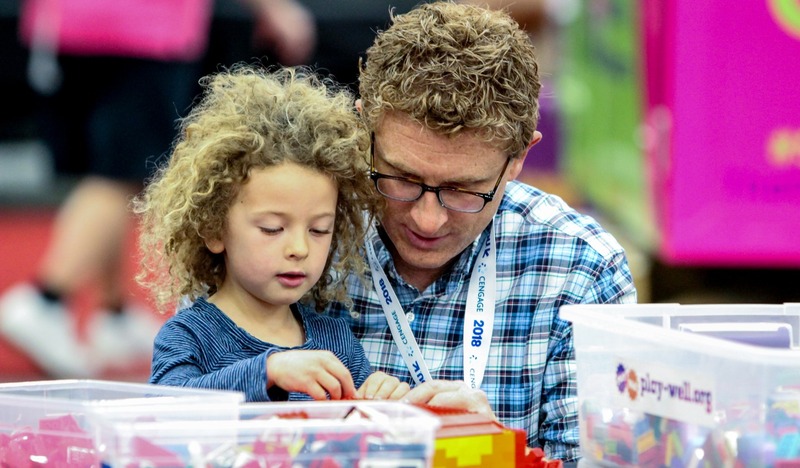 SXSW EDU is a leader in showcasing and spreading innovation in education and is powerfully signaling the importance of early childhood by creating a space at this year’s conference for this important topic. In this recent blog Isabelle Hau and I co-published as well as in Big Ideas, Little Learners, there are key trends we see that correspond with this year’s SXSW EDU sessions. I am sharing in the hopes that I will see you at these discussions to engage further. Two-thirds of children under five now live in homes where both parents work, compared with fewer than one in 10 in 1940. And 4.8 million, or 26 percent, of all 2-year and 4-year college students have a dependent child. As our economy and society have shifted, parents have recognized the need for additional education and training to support their families. In the session, Parent Learners: Triumphs & Struggles, current and former students who attended higher education while parenting will share their experiences – from their motivations for going back to school to one of their greatest pain points in managing the responsibilities of caring for children while studying and working. I am excited that the SXSW EDU community will have the opportunity to hear about two generations being uplifted through education together. While we have known for a while the importance of focusing on the whole child, enhanced curricula are emerging anchored in the science of learning. This includes active learning, integration of socioemotional learning and executive functions, and a focus on the needs of diverse learners. As the panelists from Beyond ABCs and 123s: Going Deeper with SEL note, “Integrated, comprehensive, and culturally responsive social and emotional learning (SEL) is a critical component for early childhood education. However, understanding the need for SEL instruction and implementing evidence-based practices present two entirely different challenges.” I’m hopeful that the deep expertise on this panel will shed some new light and practical solutions for meeting the social-emotional needs of our young, diverse learners. With big problems to be solved, and rising demand from parents and governments for solutions, a wave of innovation is building momentum in the early childhood field. Some of that innovation is technology-enabled and child-facing. While tech’s intersection with children has come under greater scrutiny, we need to rethink more responsible, ethical, thoughtful, transparent tech created by designers with the child’s well-being in mind. In the session, Make Intentional Decisions No Matter the Tech, early childhood veterans and child technology experts will highlight tech as a tool while grounding us all in the importance of the choices and methods of the humans, in this case early childhood educators, who are using those tools. I’m thrilled for the opportunity to learn more about such an essential and timely topic from these panelists. During the early years, children and families are touched by many different systems and people. Technology has created the opportunity for all of these parties to share data and information, so that everyone can more effectively meet their goals and ultimately create impact. But technology alone can’t create the space for this collaboration. It requires people and policy to leverage data systems. During Making ECE Integrated Data Dreams a Reality, panelists will share practical insights on how they implemented better data systems in their state agencies to, as they say, “make their stakeholders’ data dreams a reality.” They also will highlight ways that integrated data can improve policy and practice. We share several examples of effective collaboration around data in Big Ideas, Little Learners, and I’m looking forward to hearing more. Recognizing the huge opportunity for impact and the need for new solutions for our littlest learners, new pools of funding are coming into early childhood— across philanthropy, impact investing, and venture capitthe al. I’m delighted to be a part of discussion with a dynamic, mission-driven group of investors examining The Rise of Impact Investing in Early Childhood. We’ll highlight the most exciting areas for innovation, what the future of this market holds for investors, children, and families, and why the time is now! I hope that you’ll join us. With all of the energy and focus from the SXSWedu community on early childhood, I’m optimistic that new ideas will be sparked and existing ideas will be spread to impact young children during the most important time in their education and development. Let’s build the future of children and families together. Photo by Randy & Jackie Smith.